MeanShift has two important parameters we should be aware of. First, bandwidth sets radius of the area (i.e. kernel) an observation uses to determine the direction to shift. 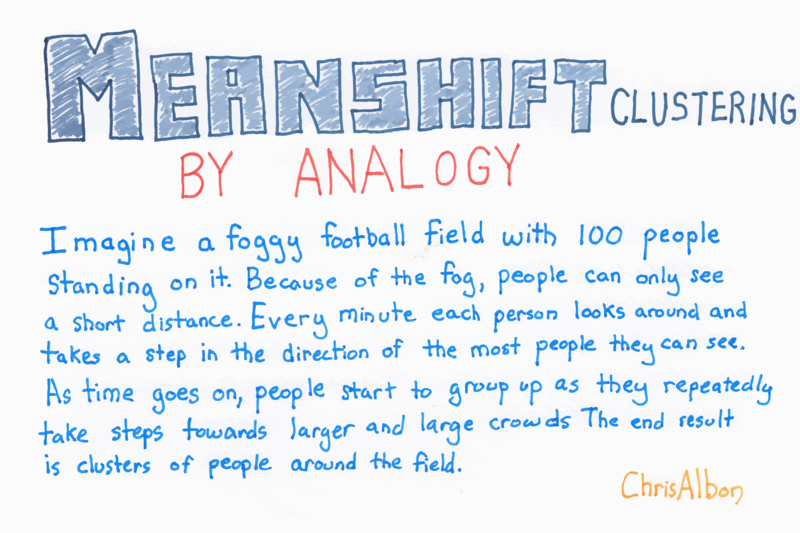 In our analogy, bandwidth was how far a person could see through the fog. We can set this parameter manually, however by default a reasonable bandwidth is estimated automatically (with a significant increase in computational cost). Second, sometimes in meanshift there are no other observations within an observation’s kernel. That is, a person on our football cannot see a single other person. By default, MeanShift assigns all these “orphan” observations to the kernel of the nearest observation. However, if we want to leave out these orphans, we can set cluster_all=False wherein orphan observations the label of -1.